It’s one thing to want to start a new clothing line and another to do it. For writers, the difference is sitting down to write. For athletes, it’s putting feet to pavement. For clothing designers and entrepreneurs, it’s outlining the first collection. Many of us are lucky to be surrounded by the things that inspire us, but it takes discipline and practice to channel that inspiration into something definite. Luckily, it really starts with small steps, like grabbing a pen and paper or putting on tennis shoes. Here’s a roadmap for how to do it. At the end of this post, you’ll have what you need to get started on our quick and dirty cheat sheet that’ll prepare you for development of your line. Inspiration may come from anywhere, but the difference between the dreamer and the entrepreneur is that the first lets inspiration come to them and the second actively seeks it out and captures it. The question is, where are you getting your ideas from and how can you make a habit of becoming a sponge? Pinterest.com may just be the heart of fashion on social media even if it’s not the place where your particular target market congregates. Still, some marketers think Pinterest.com is the future, whether you’re designing blouses for professional women or athleisure wear for weightlifters. The beauty of Pinterest is that it not only lets you see what people like, both in terms of style and presentation, but it also allows you to pin images and save them for later. For the designer whose heart is set on high fashion, Vogue and GQ are the top magazines to see what is trending on the runways of New York, Paris, and Milan. But, don’t just flip through the pages. Think about the designers who most emulate your vision. Think about the way they’re presenting their clothes and what that says about their target market. Find the clothes online and look at how they’re presented. Start a collection of go-to designers that either reflects your aesthetic or have a certain something that you’d like to incorporate into your designs. If Vogue and GQ don’t suit your fancy, go for more niche publications that reflect your target customer’s aesthetic. Runway shows like New York Fashion Week can be a great way to see which designers are causing the most fuss and what celebs and models are wearing to be seen. If high fashion isn’t your thing, look to one of the many niches and local fashion shows that pop up in every city. It could be Eco-Fashion Week in Vancouver, Indie Fashion Week in DC, or standalone shows in your city. Activities don’t have to be in fashion to be inspirational. If you want to develop a new clothing line, it’d be better to go to a yoga festival or retreat than New York Fashion Week. If you’re into weightlifting, it’d be better to go to gyms and competitions. If you want to design streetwear, then go to popular neighborhoods where your target customer lives and just see what they’re wearing. It’s called people watching. Just, this time, do it with a goal in mind. Sneak in some photos, jot down some notes, and save that inspiration somewhere good. You don’t just want to expose yourself to outside influences, you also want to be disciplined about how you catalog ideas. Here are some ideas for how to do that. Evernote is perfect for organizing photos, notes, articles, and more. With the Evernote app, you can upload images or jot down notes; with the Evernote Chrome extension, you can clip articles and websites. Then, it’s up to you to create dedicated folders, called notebooks, and tags to organize and hone your first looks. Create different notebooks for inspirational designers, for specific clothes, for research into manufacturers, and more. If you want to take it a step further, make a goal of adding one new designer or look a week, and jot down alongside it price points, fabrics, functionalities, or anything else that attracts you and could guide your future line. We’ve mentioned Pinterest before and it has the potential to be a one-two punch, not just as a source of inspiration but also as an ongoing digital scrapbook for organizing ideas. With the Pinterest Chrome extension, you can also pin anything and everything you find on the web that catches your eye along with some notes. It’s more visually oriented and less dynamic than Evernote – you’ll need a separate spot for deeper research – but it’s a great start. Similar to my recommendations above, you can make a goal of uploading x number of images to Pinterest a week or creating y boards a month around looks you want to design. 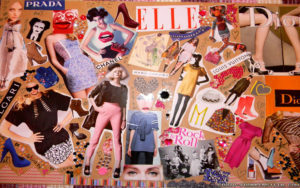 Another way you could get organized is through old-fashioned collages and scrapbooks. They don’t have to be big, colorful affairs – even a simple notebook will do. As with Evernote or Pinterest, you can go as shallow or as deep as you’d like, using it just to save looks you like and ideas that pop up in your head or also to solidify serious research into colors, materials, and market research. For example, you could take a 5-subject notebook and dedicate 1 subject to outside inspiration, 1 subject to specific looks, 1 subject to materials and colors, 1 subject to pricing research, and the final subject to market research. The point is just that you take it beyond inspiration to something concrete. The next step is realizing that your collection isn’t just about you. Really, it’s about your customers. If anything is responsible for the failure of most fashion designers (and business owners in general), it’s this. Ultimately, your new clothing line must cater to the wants and needs of your customer base if you are to succeed, and that means thinking about the following items as you focus your collection. Who do you see as being your main customer? What age group do they fall into? Where do they live? Do they live on a ranch in Billings, Montana or in a high-rise apartment off Michigan Avenue in Chicago? Do they wear cowboy boots or stilettos? Knowing how your target customer uses their clothes and how they like to purchase their clothes is one of the most important aspects in designing and selling a successful line that grows stronger with every passing season. A connection with your targeted customer is huge and it’s directly related to your future success. I recommend taking your weapon of choice above, whether it’s Evernote, Pinterest, or a scrapbook, and showing it to your target customer (preferably not friends and family unless they’re the brutally honest type) and see what they say. Incorporate their feedback into revisions of your designs. Looking ahead and seeing where trends are headed is big. Are trends heading from black and white into multi-colors or perhaps from solids into plaids? Staying ahead of the game will keep your line fresh and successful. Analyzing fashion trends and following trendsetters will only increase your chances of developing successful lines. Positioning is a PR term for what makes your new clothing line different and, in the crowded marketplace that is retail, this is crucial. It may not even be that your new clothing line is really that different, but how you think about positioning will still help you design your collection now and market it later. Maybe it’s introducing traditional fabrics to a new niche like Allbirds did when they sold wool sneakers to Silicon Valley techies, or it’s putting new tech in boring clothes, like Indie Source customer FitScrubs did when they put anti-microbial fabrics in scrubs for medical professionals. Ask yourself, what is the it-factor in your collection? Why will it excite customers? The trend and color forecasting site Pantone.com can be used to help you develop color standards. You can go with a complimentary or monochrome scheme to tell your story throughout the collection. Paying close attention to trending colors and designs will help you decide which direction your collection will take. Color wheels are used in retail settings to put like clothes in a pattern that flows flawlessly from color to color. This helps retailers draw the customer into a specific product. Color can make or break any piece of clothing and is important when creating your collection. Fashion isn’t all fun. As any athlete knows, fashion can also serve a primarily functional purpose. For mountain bikers, clothing needs to breathe and sealable pockets are a serious utility. But, even outside of athletics, a function can be huge in ways that most of us overlook. Winter wear may benefit from outside pockets large enough to fit gloves without looking bulky. Inside pockets or easy packing would be a boon to frequent travelers who are nervous about thieves and travel light. Professional women may want fabrics that look sophisticated but don’t need dry cleaning. As the expression goes, form follows function, and this is especially true for clothing designers. How will the design functionalities of your clothes enhance them for your target customer? At this point, we’re getting very close to what your future line will look like. The garment pattern is literally the pattern for the clothing you want to design. If you’re not here quite yet, never fear: you don’t need a degree in fashion design, the ability to sew, or expensive software to be a fashion designer. What you do need is a general idea of what you’d like to design (see above) and reference samples. A reference sample is an item of clothing that resembles in some way the clothing you’d like to design: it could be the garment pattern, it could be the design functionality, or it could be the materials or colors. Hopefully, it’s all of these in combination. If you don’t have the technical skills to draw up a garment pattern, a good reference sample can go a long way towards fleshing out final designs with a capable manufacturing partner. So, are you ready to take the first steps towards your new clothing line? It’s time to stop being a dreamer and start being a doer. Here’s the quick and dirty cheat sheet that’ll prepare you for development of your line.